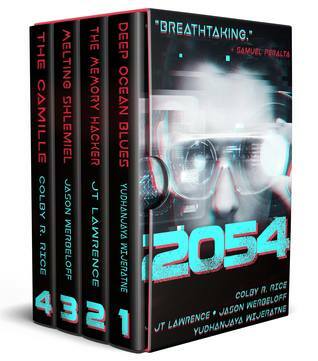 This is the third novella in the futuristic visionary collection “2054” from a diverse quartet of authors. In the year 2054, Shlomo “Shlemiel” Menachem, resident of Jerusalem and member of a conservative Jewish sect, lives inside a shell, a personalised safety Bubble and something all humans in Jerusalem have (from what I could tell), that he was put into following his bar mitzvah. Being a clumsy individual, this transformation came as something of a blessing to his parents, but it still causes problems to Shlemiel. Communication is via some type of morse code that is either thrummed through thrummers located in the knee region, or by tapping on the other person’s carapace. Food – energy – is obtained by firing weapons of various types at the carapace – which presumably then converts the kinetic energy into energy the body can utilise. The only place the shell recedes is in the synagogue, when the devout step into a pool of water. One night at Shabbos, a stranger enters an overflow pool at the mikvah – Shlemiel is the only other person in that pool – and Shlemiel is drawn to the “otherness” of this person. Some days later, Shlemiel comes across the stranger again, and follows them to a red door. What lies behind the red door? Oh, there is so much to this story. From finding a solution to the “bubble-wrap” generation’s issues to taking current life in Jerusalem and fast-forwarding some decades, Werbeloff has created a really inventive future. His portrayal of the vulnerability created when one does something one perceives to be wrong was spot-on, and I appreciated his sensitivity to diversity and the need to bring together rather than divide. Shlemiel is a very endearing character, and this story was a delight – both from the human perspective as well as the technological advances envisioned.